I hadn’t walked five minutes up the trail before they ambushed me. A swarm of gnats dropped down in front of my face like a thin, black veil. Two flies laid claim to my ears—bzzzzzzzzzzzzzing in stereo. Their siege left me breathless—afraid to inhale. My swatting—swat, buzz, swat, buzz, swat, buzz, buzz!—was moot. By coincidence, I had recently watched that scene in the movie Eat Pray Love in which the Julie Roberts character successfully sits in meditation for a full hour despite an enthusiastic swarm of bugs and thoughts. She lets the small annoyances pass and finds her way to stillness. I’ve had a hard time with that kind of mindfulness — still sitting, mind clearing. A few years ago, I tried a guided group meditation. A kind and creative soul gently guided us for an hour. We floated through the sky, over the ocean, into the stars—okay, THEY floated. I spent the entire hour imagining myself running after them, trying to catch up! My mind and I are usually running after something—the next project, the next errand, the next idea. Lots and lots of thoughts…like the lots and lots of bugs around my head! In my own explorations mindfulness, my walks have become my meditation, but this day in the woods with the bugs was particularly challenging. I wanted to find my way to quiet. I tried to just be with the bugs. I walked (swat), I listened to the birds (buzz), I looked up at the trees (swat), I heard the leaves rustle (buzz). Over and over again, I tried to bring my mind back to the present—to “pay attention” as Dale often reminds me—walking on a trail, drops of rain on my head, the smell of damp earth. And over and over again, my mind would run after the bugs. Slowly, I am learning to let these annoyances pass over me. There are days when the bugs stay with me, buzzing their demands and nipping at my spirit for the entire walk. And then there are days I walk with great ease—my breath is free, my mind is clear, and everything around me glows. My mind was busy as I walked to the trail. It was one of those days. Should I go left? Should I go right? I am always indecisive when my mind is occupied otherwise. On this day, I went right—instead of left—and found my way along a narrow, woodland path. Up a hill. Across a small, spring stream. 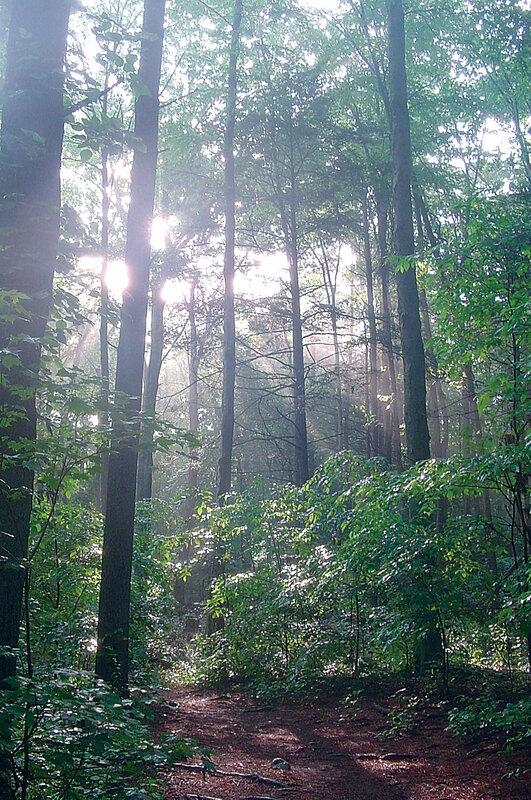 Into the quiet of the woods—I was breathing again. There, in front of me, a patch of new ferns congregated along the edge of the trail, and I paused for a moment. Down on one knee to look closer, I realized I was no longer worrying about the worries that were worrying me. Funny how that happens, isn’t it? Right there, I gave myself an assignment: Look down, be quiet, pay attention. And there they were. Small clusters of wildflowers, patches of delicate ferns, bright colors, and playful shapes. New spring life, all along my path. I never would have seen them. Look down, be quiet, pay attention. I knew right away it was a magical day in the woods. The gorgeous 50-degree afternoon was accented by a bright blue sky and a soft breeze that sang through the trees. I saw a trail I’d never seen before, followed it to the edge of the pond and sat for a while. Sat. Quietly. I’d been invited to do so by the turtle who was on the log but disappeared as soon as I sat down. I waited for him to return, but he never did. So I made my way back down a familiar path until I heard the distinct rustle of a hawk landing in a tree just up a hill. I stood silently for five, maybe ten minutes, watching it perched up high. But, when I decided to get a closer look, he took off into the tops of pine trees nearby. As I continued on my way, he flew above me, casting shadows on the path—he was watching me now, and we both knew it. A squirrel stopped when I called to her, but dropped her acorn from the startle. “Go ahead, go back and get it,” I told her, then stepped gingerly back a few steps to allow safe space. She scurried down the tree, snatched up her meal, then glanced my way as if to say thanks. A carpenter bee was busily moving about when I came upon her. I watched for a while as she crawled in an out of her burrow—spring cleaning, I wondered? Walking further and further down the path this way, I could feel peace settle in. If I closed my eyes and breathed, I barely existed—except to feel the breeze on my skin and hear the whisper of trees. My footsteps, my heartbeat, my thoughts were so far away, they sounded hollow and unreal. From the flirting of birds in the trees to the surprise of late-spring wildflowers come early, the forest was brimming with life and spirit…and suddenly, so was I.
Excerpted from LOOK UP! Musings on the Nature of Mindfulness, by author and naturalist Jen Payne. Both LOOK UP! 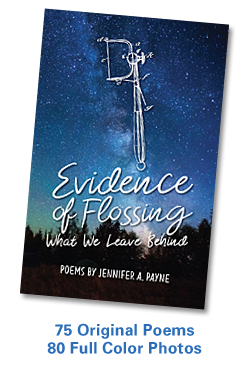 and her new bookEvidence of Flossing: What We Leave Behind, are available for purchase from Three Chairs Publishing. This entry was posted in Books, Creativity, Ecospirituality, Mindfulness, Nature, Photography, Poetry, Publishing, Spiritual Ecology, Spirituality, Writing and tagged Book, Creativity, Ecology, Environment, Mindfulness, Nature, Photography, Poetry, Spirituality, Writing. Bookmark the permalink.